While early days with a newborn can be exhilarating, they can also be exhausting and unpredictable. Baby’s circadian rhythm is “upside down”—they want to sleep all day and feed all night. This “upside down-ness” can leave newborns too sleepy to eat during the day and too hungry to sleep at night. Making sure baby is exposed to light early in the morning and during the day, enforcing darkness at night by keeping lights dim, and frequent daytime feedings will help baby to sync their biorhythm with that of their parents by about 4 – 6 weeks of age. Priority #1. Feed the Baby! In the first days and weeks, this means making sure baby is fed at least 8 times (every 2 – 3 hours) in 24 hours. For an exclusively breastfed baby, it is not unusual for baby to want/need to feed even more frequently! It is also not unusual for newborns to be so sleepy that it is difficult to keep them awake for a full feeding, so having a support person is very helpful. Once we know that baby is feeding well, it will not be necessary to be quite so vigilant about frequency of feedings. Priority #2. Delegate tasks to willing family and/or friends. Since feeding and caring for a newborn is so time consuming, tasks such as grocery shopping, cooking and doing laundry become challenging to accomplish. If you do not have available local family/friends, consider outsourcing these tasks during those first days and weeks (think grocery delivery and Doordash). While your helpers are doing your chores, you can be feeding your baby (and yourself!) and napping. Remember: This, too, will pass. As exhausting as this phase can feel, it is just a phase. 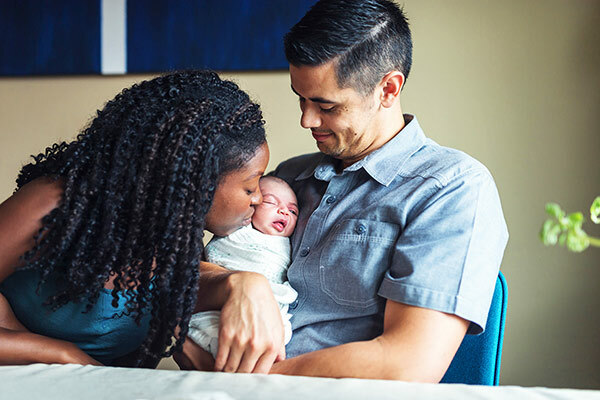 Before you know it, your baby will look up at you and smile … and you’ll realize that those hard first weeks were worth it! Cherie Tannenbaum, NP, IBCLC, is a family nurse practitioner, certified lactation consultant, family educator, and coordinator of Babies & Beyond at Parents Place in Palo Alto. She has been helping new families care for their babies and adjust to their new lives for over 30 years and is the mother of 4 adult daughters. Find more information about a private consultation or her “Baby and Me” groups and classes at Parents Place.